Sift the flour, add salt, water, whisked egg, mix well and knead uniform, smooth dough. If the dough is sticky, feel free to add more flour. When ready, let the dough "rest" for 15 min. Soak dried mushrooms in warm water for 1 hour. Boil mushrooms for 15 min, strain and minced. Heat oil, fry onion and garlic, add mushrooms, fry about 5 min. Add bread crumbs, salt and pepper. 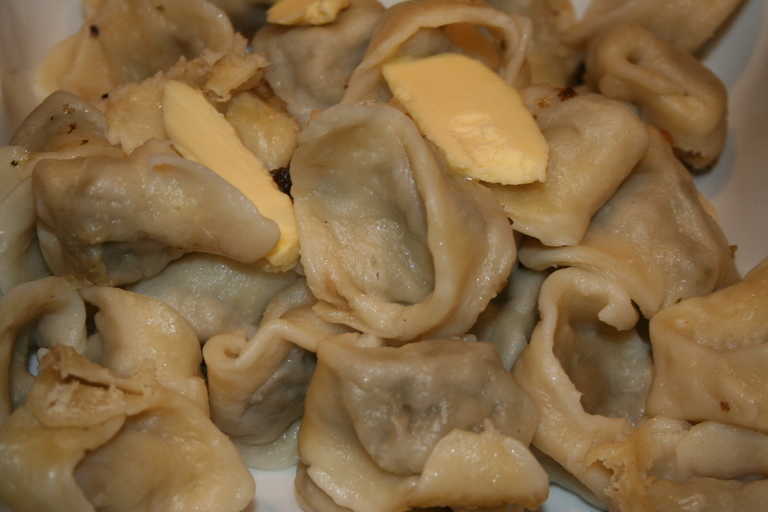 Roll out the dough, 1,5 mm thickness, cut out rectangular, put one tea spoon of mushroom stuffing, fold in half, diagonally, close the edge to form triangle, stick together two corners to receive "ravioli" shape. Repeat with remaining dough. Cook in boiling water for about 5 min. It's possible to serve them as side dish garnished with butter or add to beetroot soup.